the winter night and are a sign of hope for the future light of spring. time. It is a sign of faith in humanity and life and of victory over life's challenges. 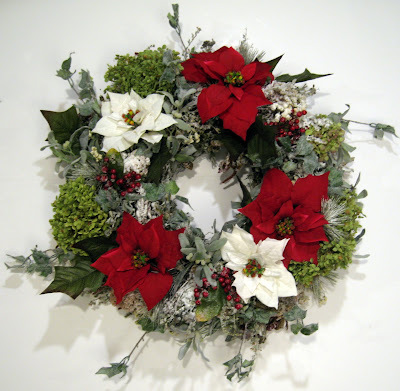 Whether you hang a wreath on the door to welcome visitors or on a wall to complete a room's decor,the splash of color on a cold winter's day is sure to add a feeling of warmth, building excitement for the coming season. 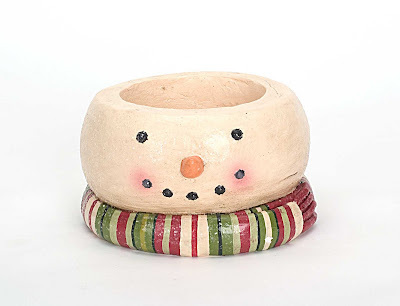 for the Holiday Gift Open House, both holiday-specific and everyday. 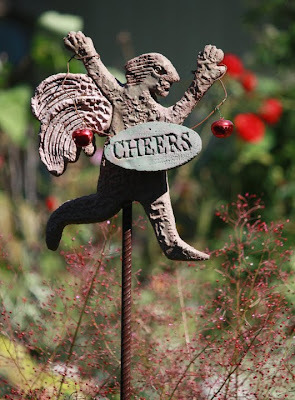 Angels are familiar icons during the holidays for sure but they also grace our gardens year-round. 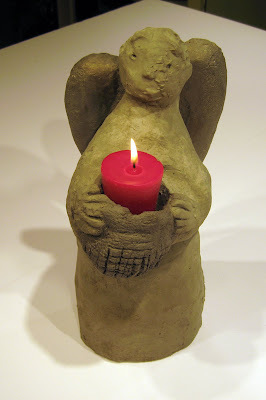 This new concrete angel sculpture holds a small basket. 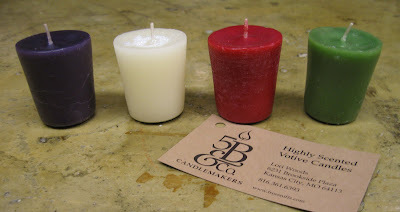 You can pop in a scented votive from 5B & Co. Company Candlemakers or fill it with bird seed. It is at home either indoors or out. 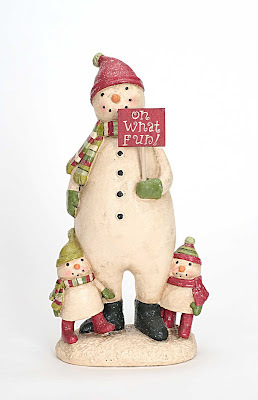 This double-sided snowman head holding a small lighted tree is perfect for your porch table or step. Visitors to your home see his happy face both coming and going! 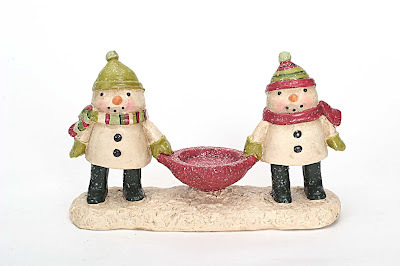 HOLIDAY GIFT OPEN HOUSE-1 WEEK AWAY! The leaves are at their colorful peak right now and the rains are bringing them down faster. It is beginning to look like autumn in the garden. The brilliant purples, pinks and greens have been replaced by richer hues of cinnabar, gold and sienna. 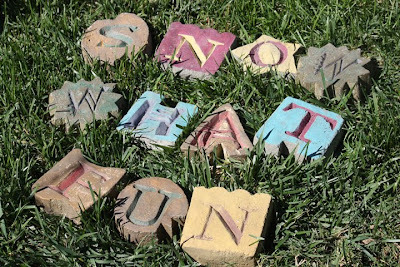 The alpha stones spelling out the theme for our Holiday Gift Open House would look more at home in white snow but hey, the green grass is a lot easier to deal with! Please stop by and visit SNOW WHAT FUN. We're busy transforming the studio into a fun shopping experience and boy, you should see the artist's work- Exciting! 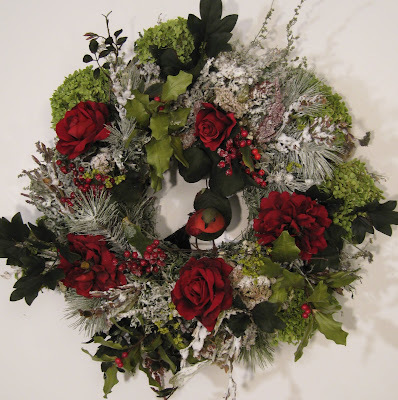 I had the wonderful opportunity to work for a small import company that specialized in holiday home decor. It was great fun creating holiday-themed collections. 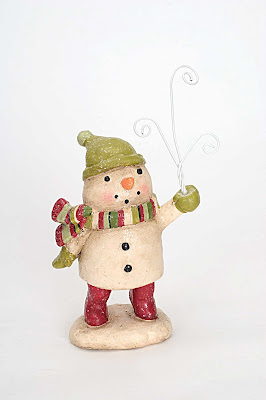 One of my favorites was Snow What Fun, which just happens to be the theme for this year's Holiday Gift Open House. 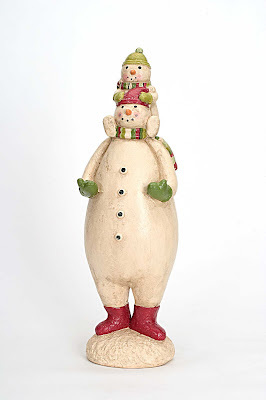 In this collection, I finally got to create my paper mache snowman collection in collaboration with a great designer in Kansas City named Jeff. 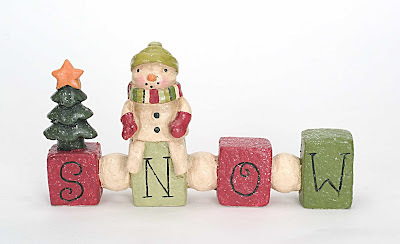 Here are a few pieces of Snow What Fun that will be featured at the Open House. Many of the pieces are functional as well as decorative items. This little guy serves as the title piece for the collection. It just may be that this winter will bring us lots of snow, might as well have some fun in it! 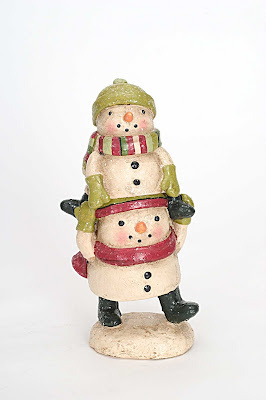 The two little kid snowpeople have a ball in the snow! ...or even a large pillar candle! a perfect gift-presenter if you are giving someone tickets to a special event. 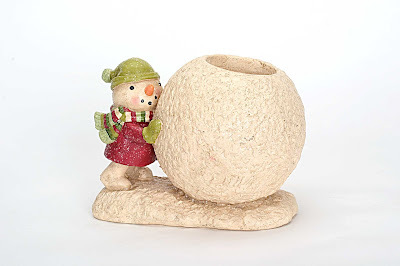 a snowball big enough to hold a holiday floral centerpiece! 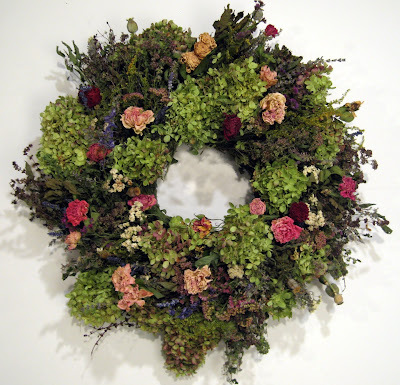 but will also hold a small to medium holiday wreath. Lori makes wonderfully scented candles and sells them along with gifts and home decor items in her shop in Brookside, MO. 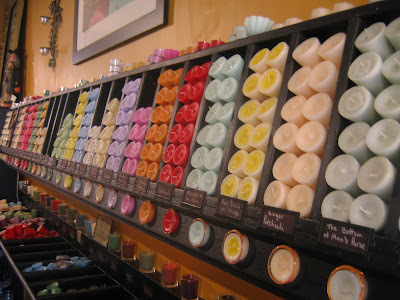 She brings a wonderful selection of scented votives to the Holiday Gift Open House and custom makes four scents to match Bill Jones' soaps and skin cremes. -The deep purple is ROCK THE NIGHT AWAY and features a black current scent. -The sparkling white is ONE HORSE OPEN SLEIGH with a fresh outdoor holiday scent. -The bright red is JINGLE HOP carrying a fresh berry scent. -DANCIN' & PRANCIN' is green and smells like a fresh cut Christmas tree. 6231 Brookside Plaza, KCMO. You can visit her website at www.freesniffs.com. It's not going to last much longer! 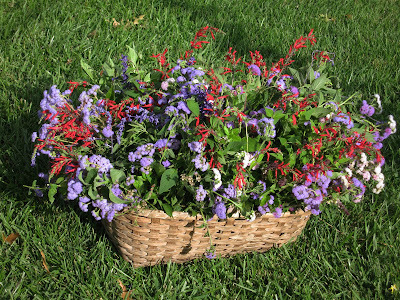 The bright red of the Pineapple Sage blossoms sets off the analogous purple of the old fashioned Ageratum. What a brilliant combination that must be enjoyed at this moment because soon the frost will knock both of these plants out for the season. This SNOW WHAT FUN Holiday Totem Stake looks a little out of place in the lush green garden setting now, but just wait until we've had our killing frosts and the color is gone from the garden. 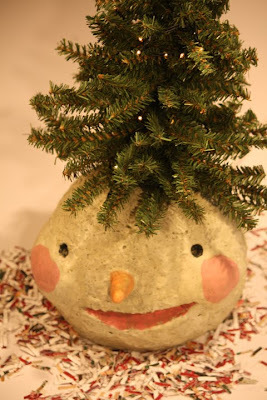 This cheery totem stake is sure to lift your spirits and put you into a holiday mood. 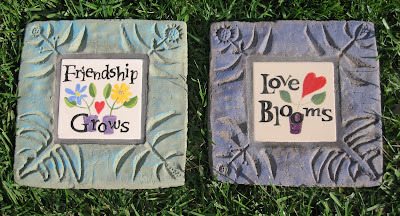 Our LOVE BLOOMS message stone just got a new companion! 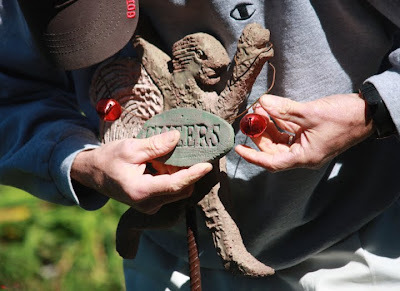 The FRIENDSHIP GROWS garden stepping stone will be available at the Holiday Gift Open House in November. Both of these garden stakes feature removable attachments that give you the option to use them in your garden all year. The jingle bells and "CHEERS" come off once the holidays are over. 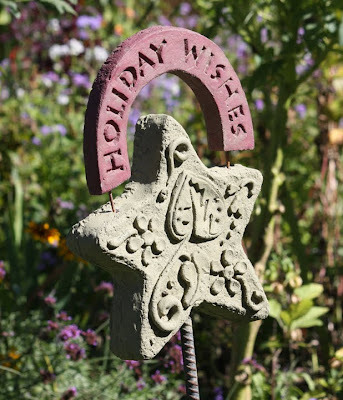 The holiday wishes lifts off this star stake once the holiday season is past. 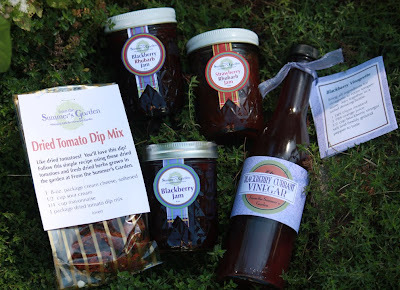 Because our garden produced buckets of luscious strawberries, blackberries and rhubarb this growing season, we will be able to bring you Blackberry, Blackberry-Rhubarb and Strawberry-Rhubarb Jams and Blackberry Vinegar available at the Holiday Gift Open House in November. The tomatoes were bountiful as well which means we'll have plenty DRIED TOMATO DIP MIX ready for you too!